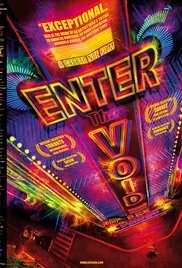 Enter the Void is a 2009 English-language French drama film written and directed by Gaspar Noé and starring Nathaniel Brown, Paz de la Huerta, and Cyril Roy. Set in the neon-lit nightclub environments of Tokyo, the story follows Oscar, a young American drug dealer who gets shot by the police, but continues to watch subsequent events during an out-of-body experience. The film is shot from a first-person viewpoint, which often floats above the city streets, and occasionally features Oscar staring over his own shoulder as he recalls moments from his past. Noé labels the film a "psychedelic melodrama". Read more on Wikipedia.